When you’re searching the web for a good customer relationship management, or CRM, system, it’s impossible not to run into Zoho reviews here and there. Zoho CRM boasts rich features, continent-spanning popularity and no few professional adherents. Of course, it’s not the ideal solution for every business. Keep reading to discover whether Zoho might be a smart fit for your growing enterprise. Zoho Corporation is a Californian tech firm that focuses on software as a service, or SaaS, offerings. In addition to its CRM suite, its products include the ManageEngine IT management package and the enterprise internet of things, or IoT, platform known as WebNMS. As a private company with more than 3,500 employees, Zoho is known for its research and development, support capabilities and established technologies. Originally founded in 1996, the company grew to cater to the needs of more than twenty million users by 2016. Most of Zoho’s software and support services originate in Southeast Asia even though the firm maintains significant operations in the U.S.
Zoho CRM is designed for multichannel consumer engagement. It includes a number of process-specific features and tools, and it’s laid out around different task-oriented dashboards. One appealing aspect of purchasing a Zoho CRM plan is that you don’t have to sign up for a contract. If a specific version isn’t cutting it for you, you can cancel, upgrade or downgrade at any time. What Capabilities Does It Include? Your staff can display and search email messages without exiting the Zoho client. To handle high-volume tasks like sales management, they can employ messaging and lead-tracking tools to distinguish which conversations are the most lucrative. Users can filter emails according to custom statuses and response conditions. This makes it possible to differentiate conversations that have ground to a halt from those that require prompt responses. The dashboard also features reporting that could offer some insights into the kinds of email templates that lead to the highest open rates and the most successful responses. Like other Zoho CRM tools, the email system facilitates team performance tracking. Even if you’re already married to a given email app, like Gmail or Outlook, Zoho’s compatibility with different clients, campaign integrations, note-taking capabilities and instant notification system could help you centralize your routine CRM activities. Zoho also keeps track of opt-out requests so that you don’t end up losing goodwill by harassing someone. Users can place one-click calls from within the software and view performance analytics on demand. Zoho reviews also highlight the fact that you can set up call reminders via the PhoneBridge tool and make calls from individual profiles so that you don’t have to worry about forgetting important details, like people’s names or account information. Zoho CRM also automatically logs call statistics and generates customer experience data. It can be integrated with a range of VoIP, PBX and other call-management service providers, which is convenient for companies with data-dependent business models. This dashboard allows users to manage accounts, view trends, research leads, and analyze social-media consumers from platforms like Facebook, Twitter and Google+. Zoho reviews say that using the CRM platform’s social dashboard is fairly straightforward compared to many of the software’s other feature-packed views. Your workers can create custom listening streams and filters for different deals and groups of people in order to receive social updates in real time. Or they can get pinged when your brand has been mentioned by one of your contacts. These updates might help you stay on top of important consumer trends and potential prospects. The Zoho CRM chat tool lets you examine histories, contacts and customers in addition to conversing live. It’s also possible to create follow-up tasks and convert the profiles of your chat partners into fresh leads. At first glance, this tool looks like it would be a good solution for people who want to supplement their existing website offerings with improved customer-service features. It automatically summarizes previous user visits, saves missed messages as notes and keeps track of conversations, so your agents might find it easier to meet simultaneous demand from larger volumes of consumers. Zoho’s chat window segments visitors automatically and displays the resulting data in straightforward charts. By default, you can examine the keywords that people used to find your page as well as their regions of origin, but the tool also supports in-depth customization. Zoho CRM includes a mobile app that comes complete with calendars, event check-in tools and notes to help you organize meetings, networking powwows and seminars. You can also photograph physical business cards to save lead information and communicate with your team members via live feeds. The Zoho CRM mobile app is billed as a personal assistant and daily planner. It works on iOS and Android, but it also integrates with the desktop version so that your team members all have access to the same data sources. In addition, the app provides location-aware displays that permit users to view their appointments and customers on an actual map. Zoho review writers like the fact that while it’s nothing mind-blowing as far as personal assistants go, you can customize the layout, work offline and stay engaged with coworkers. Can You Customize Your Zoho Implementation? Zoho CRM also includes a massive array of add-ons and integrations. While some Zoho reviews balk at the sheer number of upgrades and supplementary dashboards in the company’s official library, others say that this is one of the software’s biggest strengths. A significant portion of these add-ons are provided by third parties, but valid ones have the Zoho seal of approval and appear to have been tested by the company itself. Some are also free of charge to qualifying customers, such as the Amity customer success software integration that’s available to all businesses that use Amity and Zoho. You may be able to try some of the Zoho CRM integrations on a free demo basis. Performing common sales, marketing and support workflows. Zoho CRM also facilitates case-by-case approval of automated actions. Its oversight options are important because they help you retain control of business processes that could grow fairly complicated if left to their own devices. Compared to other CRM and business management tools, Zoho seems to offer way more when it comes to creating smooth-running processes that require little human intervention. For those who prefer to roll up their sleeves and dig in, Zoho offers an application programming interface, or API. With this code toolkit, you can create your own custom integrations and features in various programming languages, such as Java, C, PHP and .Net. The API also pulls data from the CRM in XML or JSON formats, so it’s possible to use any language you prefer. One nice feature of working with the Zoho CRM API is that you can test your creations in a sandboxed environment. This makes it much easier to aim for the moon without jeopardizing your existing business processes. The API also supports communication between different Zoho apps, and its methods and typical usage cases appear to be well documented. While Zoho CRM is definitely powerful, you can’t just jump right in. The dashboards and tools require that you go through different setup processes to define workflows, filters and other relevant parameters. Fortunately, Zoho CRM also guides you through configuration one step at a time. 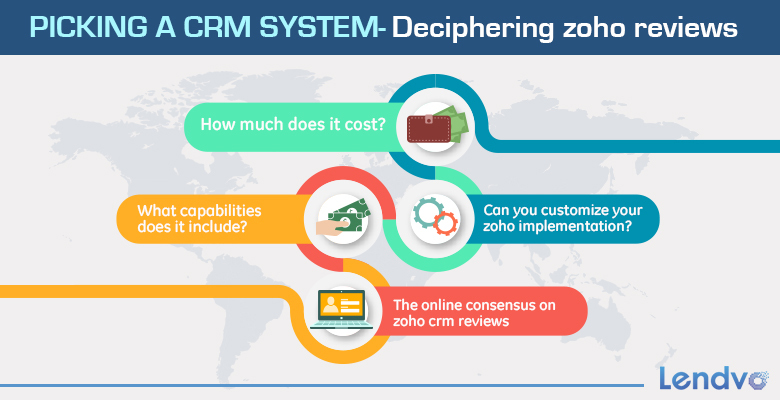 Although the initial hurdles are somewhat substantial, PC Mag reviewers say that Zoho CRM is ultimately simpler than alternatives like Salesforce when it comes to critical tasks like creating new users. Zoho CRM’s free trial also beats out many other CRM software demos. This is primarily because it allows multiple users, so it’s actually representative of real-world deployment situations. If Zoho CRM receives one common criticism, it’s that the software may overwhelm smaller companies and teams. For instance, the platform’s distinct lack of native processes that are structured around project management can prove confounding to entrepreneurs who thrive on hopping from one job to another. Of course, you can install an integration to add such features, but you should be aware that you’ll also be increasing your software costs. Businesses without significant human resource pools may even find themselves with more outreach capacity than they can actually support. Zoho CRM might be more appropriate for small and medium-sized enterprises that are trying to reach the next stages of their evolutions. Getting used to the tool dashboards and preset workflows takes some time, and if you’re a tiny company, you may not be able to spare the effort. Datacenter, server and website oversight. Like Zoho CRM, ManageEngine is for a niche crowd. Unless your business model involves dedicated data centers and extensive IT assets, this software is unlikely to appeal to your immediate interests. On the other hand, if you’re trying to lay the foundations for a backend that supports your future expansion, using these tools is probably a good way to get started. Generator, solar farm and windmill management. WebNMS seems like a handy solution for any small business that wants to get a firmer handle on how its IT resources and physical assets operate. Unlike some IoT business-management tools, it includes distributed asset-management capabilities that make it easier to track how your company’s ATMs, fleets and other remote hardware impact your business model. Is Zoho Right for Me? Zoho tools are a mixed bag. While the ability to customize the software and bend its workflows to your will is a definite plus, there’s also a learning curve to overcome. You’re likely to spend a few hours watching help videos and tweaking settings before you actually get any real work done. Once you’ve survived the initial growing pains, however, you’ll probably make up for them in time savings. In terms of CRM efficacy, Zoho is as capable as any other solution on the market. For most users, its comparatively low price, comprehensive customer service and huge integrations menu are worth the setup hassle. It’s also nice that all of Zoho’s software solutions are compatible with one another, so you can readily sync and share information as you expand your tool set. Are you a die-hard fan of Zoho CRM or the company’s other tools? Let us know how you feel by leaving a comment. You can also discover more tips and tricks for growing your small business by checking out the other great Lendvo articles.